BUILT TO ORDER: L&L Jupiter Polygonal sectional kilns come in 10 sizes from 2.6 cubic feet to 17.2 cubic feet. They are available in 3 basic cross sections from 18" high to 45" high. 2-1/2" or 3" firebrick. Standard or heavy-duty elements. Customize these kilns with a wide variety of options. Sectional design and "Pull-Apart" Option make these perfect for sculptural pieces. Ask about our professional delivery and setup of kilns and other ceramics equipment. Most Models Rated to Cone 10 - 2350 F (The 18” high J23 and J2918 are rated to Cone 5 unless you get a powered bottom). Dyna-Glow Ceramic Element Holders Protect Firebrick - Result in Much Longer Kiln Life. Choice of 2-1/2” or 3” Brick - Hardened With Special Facing. Industrial Type Element Connections with Special Ceramic Blocks. UL / Canadian Listed. 480 and 380 volt kilns are not listed but are made to National Electrical Code standards. Easy to Move and Set Up. Reversible Bottom. Three Adjustable Case Clamps per Section. Optional Bottom Element Bottom elements are available on all models except the J18 and J18X. 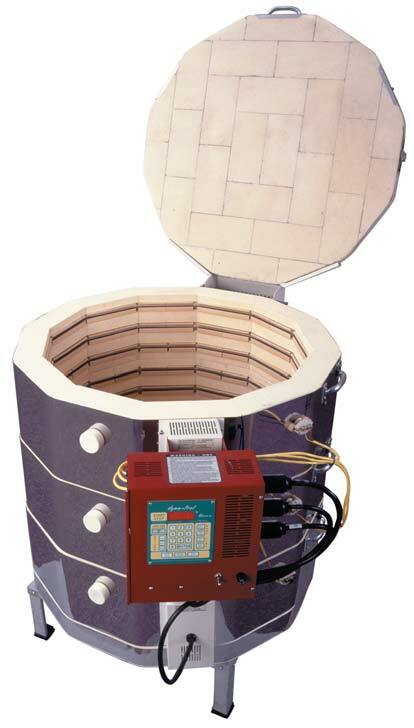 Optional “Pull-Apart” Kiln : A few minor design changes make the Jupiter kilns easy to dismantle and reassemble to solve unusual loading problems such as firing high sculptures. Kilns can be ordered with no hinge and an easy lift off top that features four handles. The control panel is mounted on a floor stand.The kiln sections easily plug into the panel. This is a no cost option available on all models. Service and Quality - Three Year Limited Warranty. Detachable Panel With Protective Air Space. 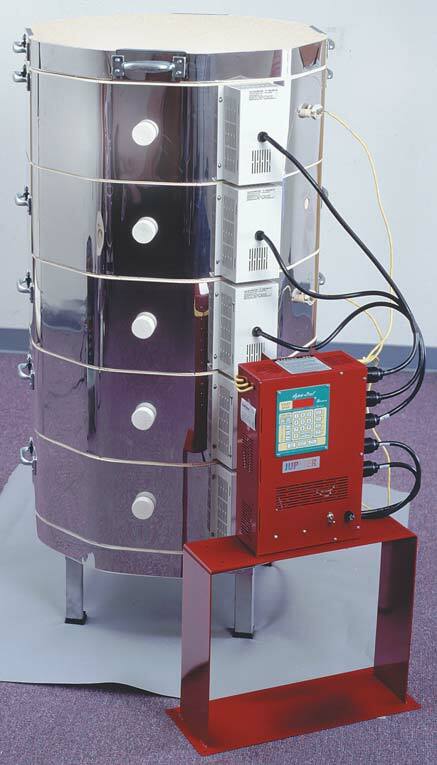 Branch Fusing included on High Powered Kilns Power Cord for Smaller Single Phase Kilns. A 50 amp 6-50P six foot power cord is included for J18, J18X, J23, J23PB and J230 single phase models. All other models feature a direct hook-up power terminal block. L&L JD18 Jupiter Kiln : 17.5 x 18"
L&L JD18-3 Jupiter Kiln - 3" Brick : 16.5 x18"
L&L JD18 Jupiter Kiln : 17.5 x 18" L&L JD18-3 Jupiter Kiln - 3" Brick : 16.5 x18" L&L JD23V Jupiter Kiln : 23.5 x 18"
L&L JD18X Jupiter Kiln : 17.5 x 27"
L&L JD23V-3 Jupiter Kiln - 3" Brick : 22.5 x 18"
L&L JD18X-3 Jupiter Kiln - 3" Brick : 16.5 x 27"
L&L JD18X Jupiter Kiln : 17.5 x 27" L&L JD23V-3 Jupiter Kiln - 3" Brick : 22.5 x 18" L&L JD18X-3 Jupiter Kiln - 3" Brick : 16.5 x 27"
L&L JD230V Jupiter Kiln : 23.5 x 27"
L&L JD230V-3 Jupiter Kiln - 3" Brick : 22.5 x 27"
L&L JD2918-3 Jupiter Kiln - 3" Brick : 28 x 18"
L&L JD230V Jupiter Kiln : 23.5 x 27" L&L JD230V-3 Jupiter Kiln - 3" Brick : 22.5 x 27" L&L JD2918-3 Jupiter Kiln - 3" Brick : 28 x 18"
L&L JD236V Jupiter Kiln : 23.5 x 36"
L&L JD245V Jupiter Kiln : 23.5 x 45"
L&L JD236V Jupiter Kiln : 23.5 x 36" L&L JD236V-3 Jupiter Kiln - 3" Brick L&L JD245V Jupiter Kiln : 23.5 x 45"
L&L JD2927-3 Jupiter Kiln - 3" Brick : 28 x 27"
L&L JD2936-3 - Jupiter Kiln 3" Brick : 28 x 36"
L&L JD2927-3 Jupiter Kiln - 3" Brick : 28 x 27" L&L JD245V-3 Jupiter Kiln - 3" Brick L&L JD2936-3 - Jupiter Kiln 3" Brick : 28 x 36"
L&L JD2945-3 Jupiter Kiln - 3" Brick : 28x45"